As TV timewasters go, Supernatural can be awfully entertaining. 651 min. The CW. Cast: Jared Padalecki, Jensen Ackles. 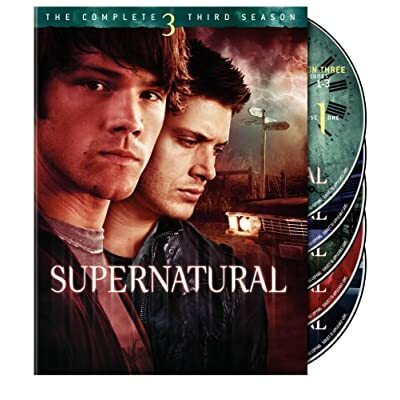 Though now in its fourth season, Supernatural had yet to grab my attention when those clever folks in Warner PR sent out an unsolicited copy of The Complete Third Season. I had written off the series as a cheesy vehicle for pretty boy alumni of WB series, but I dutifully gave the first disc a spin and quickly found myself hooked. Supernatural turns out to be a worthy successor to Buffy the Vampire Slayer and The X-Files, with which it shares a quantity of behind-the-scenes talent. Jared Padalecki (Gilmore Girls) and Jensen Ackles (Smallville) play Sam and Dean Winchester, two brothers on the "supernatural" beat. They're among the precious few humans hip to the occult dangers lurking around us: ghosts, witches, vampires, changelings, pagan gods, and demons. Especially demons. No talisman or incantation can solves Dean's latest dilemma. In order to save his brother's life, he's pledged his own soul to a demon. Dean has just a year left on Earth, and he's as determined to live it up as Sam is to find a loophole to save his brother's life. 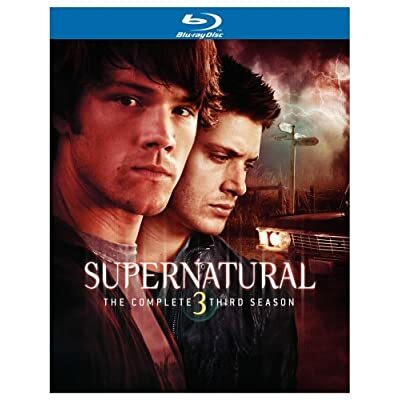 In the absence of their father, from whom they learned the family business, the boys look to Bobby Singer (Jim Beaver of Deadwood), an old friend of their father. Matters are further complicated in Season Three by the presence of two femmes fatale: the mysterious Ruby (Katie Cassidy) and occult object dealer Bela Talbot (Lauren Cohan). Each has a supernatural secret of her own and an attendant agenda: can they be trusted? Aside from the inherent cultural and historical allusions (like references to gun brands and urban legends), creator Eric Kripke peppers the series with movie references (like that name "Bela Talbot" and many of the episode titles), and cult guest stars (Michael Massee, Billy Drago, Ellen Geer, the late Don Davis) pop up. The series' ace in the hole, though, is the humor. Each season has its overarching "mythos" melodrama, giving the capable leads a chance to emote, but Supernatural goes to the comedy well with surprising regularity. Season Three has several choice outings that are out-and-out comedy-horror: "Bad Day at Black Rock," about the havoc caused by a lucky rabbit's foot; "Mystery Spot," the Supernatural version of Groundhog Day; and "Ghostfacers!" a riotous spoof of SciFi's Ghost Hunters. And I'm not even counting the episode called "A Very Supernatural Christmas," which turns out dramatically to depict the boys' unhappy childhood after bleeding Santa in the opening scene (itself preceded by the old "CBS Special" logo and theme) and before a showdown with pagan gods who seem to be living in Pleasantville. Are you getting the idea? As TV timewasters go, Supernatural can be awfully entertaining. It also gleefully serves the Evil Dead crowd with splatter gore that seriously pushes the envelope for a broadcast network series airing at 9pm. Though more is suggested than shown, directors like X-Files stalwart Kim Manners give such moments armrest-gripping jolts. Season Three's Faust-inspired storyline works like gangbusters, despite a strike-shortened season of only 16 episodes: the season-ending cliffhanger ensures the show, if you'll pardon the expression, a hell of an opener for Season Four. Warner brings Supernatural to Blu-ray in an excellent transfer that's clean, detailed and generally quite pleasing to the eye. Colors are true, and the picture is rock-steady, handily handling the image's subtleties (often overcast or nighttime location settings) and hard-working special effects with equal aplomb. The Dolby Digital 5.1 surround track adds extra kick, especially to those often agressive supernatural effects sequences. Warner has also seen fit to offer a nice package of bonus features, beginning with a series of brief "Scene Specifics" featurettes, each giving some background on a specific episode. These include "The Magnificent Seven" with Director Kim Manners (2:19), "The Kids Are Alright" with creator/executive producer Kripke (3:06), "Bad Day at Black Rock" with writer Ben Edlund (2:41), "Red Sky at Morning" with VFX Supervisor Ivan Hayden (3:37), "A Very Supernatural Christmas" with Kripke (3:04), "Dream a Little Dream of Me" with Kripke (4:04), and "Jus In Bello" with writer/producer Sera Gamble (3:22). The extensive post-production featurette "From Legends to Reality: Supernatural Effects" (23:06) includes comments by Kripke, Edlund, Gamble, Hayden, Manners, makeup effects supervisor Toby Lindala, art director John Marcynuk, special effects supervisor Randy Shymkiw, make-up artist Chris Clark and lead 3-D artist Mike Rhone. Shorter but cooler is "The Impala" (5:17), offering a tour of the classic 1967 Chevrolet Impala guided by picture car coordinator Jeff Budnick, picture car wrangler John Lange and props assistant Darren Allan. The "Gag Reel" (7:55) gives a scarily real sense of what it must be like on the set of Supernatural: fun for the cast, hell on the directors and producers as the leads waste daylight cutting up. Clocking in at around sixteen minutes is "Ghostfacers! Confessionals," an entertaining reality-style add-on in which the "Ghostfacers!" stars remain in character. Finally, Warner offers access, for a limited time, to the complete 16-episode season as a digital download for mobile playback. All site content © 2000-2019 Peter Canavese. Page generated at 04/24/2019 07:27:43AM.